If you are looking for a 14-day 200 hour Yoga Teacher Training Costa Rica Immersion, you have landed in the right place. 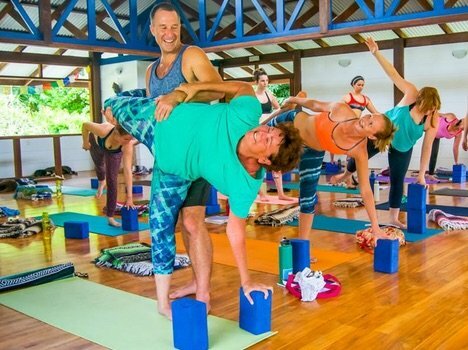 Join Yogi Aaron and Karina for an intensive 200-Hour Yoga Teacher Training in paradise at Blue Osa Yoga Retreat & Spa. You want to be a yoga teacher. You want to fully immerse for two weeks in yoga. You want to live a healthy lifestyle for two weeks. The daily routine of meditation and yoga, combined with being in the Tropics and eating fresh food does wonders for the body, mind, and spirit. You will leave this two-week immersion full of energy and a sense of renewed vision for your life. Get away from the turbulence and distractions of your daily life and give yourself the time, space and focus to deepen your practice. Expand your knowledge and accelerate your learning. Develop a strong foundational practice in yoga. Have a clearer direction of your life path. Leave with some great sequences to teach and with which to cultivate a personal asana practice. Learn how to teach within the limitations of your students. Learn how to teach multilevel classes. Have knowledge of and know how to teach yoga safely. Fully immerse in an authentic Himalayan Yoga tradition. Develop a deep appreciation of how rich this yoga tradition is. You’ll practice all of these skills directly in classes you lead during your training at the Blue Osa. Leave here taking the next step in your yogic life with greater excellence and with clearer vision. WANT A DEEPER EXPERIENCE OF A YOGA IMMERSION? CHECK OUT OUR ONE-MONTH IMMERSION 28-DAY PROGRAMS.